There are many and each is always looking for new contestants and you have the opportunity to earn real prizes such as cash, cars and holidays. Just look through a telly magazine and see that in one day you could watch Perfection, Deal Or No Deal, Breakaway, Beat The Pack, Tipping Point, Who Dares Wins, The National Lottery In It To Win It, My Man Can, Come Dine With Me, Eggheads, The Chase, Win My Wage and The Price Is Right. Rather than being sat at home watching them - you could be winning the prizes. You will need to be aged over 18 years to be on TV game shows and have a good grasp of general knowledge and common sense goes a long way to winning. Further below this Find Extra Work apply for game shows article are recent TV game show applications. 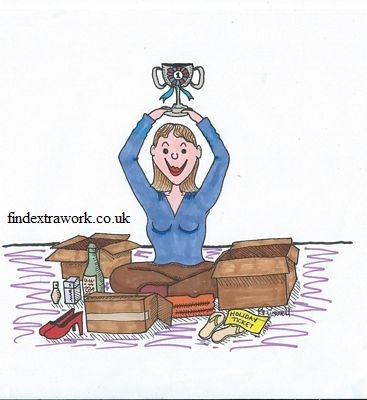 We also list vacancies on our twitter feed @findextrawork which you can join further below. Some have closing dates and this helps us spread the word much faster. Use the free beonscreen website where you get sent the latest information and vacancies, called contestant calls. Other auditions websites may help bring you to the attention of people looking for game show contestants and will be included on this page soon. Auditions and vacancies are also listed further below this page. Each quiz programme will usually have a telephone number, e-mail address or mailing address where you can apply for an application form. They will also have this information on their website. Television magazine listings will often publish adverts for panellists. Do please be aware that some of the telephone numbers are premium rate and are typically £1.50 a minute. Though if you get to be a contestant on a show and win then you can get big cash prizes such as £250,000. When you apply for TV game shows UK you may be asked to do a pre screening telephone interview or to submit your application form with a photograph. Typical questions include your name, address, social situation such as family details, work details and availability. You should declare any previous television experience. Some ask you to a pre screening audition day which is usually from 2 hours or longer. Most do not pay your travelling expenses at this stage, but they are usually held locally in an hotel or conference centre. You may have to travel to a major city like London for some programmes. The producers and executives will usually be there to observe how you interact with others, project your voice, if you can cope with public speaking and to see if you have a grasp and knowledge of the format. Refreshments are often provided. You can expect to wait to hear if you are accepted within a few weeks, though sometimes it could be months. Once accepted you will get a date, time and studio address. You may also get travelling and hotel expenses as contestants. There are some websites that will list these for you and even provide easy access to the application forms. The disadvantage of being a contestant on game shows is that you have to be confident in public speaking in front of cameras and a large studio audience. There is the risk of being asked a really simple question and giving a daft answer! Remember the contestant on Family Fortunes who when asked to name a part of the body beginning with n said knee! Practice answering questions at home with friends and watch as many of the programmes you are to appear on. The advantages when you be on a game show is that you get 15 minutes of fame and get to meet famous people like Noel Edmunds, Nick Knowles, Ben Shephard, Joe Pesquale, Anne Robinson or Chris Tarrant. There is the real chance of winning cash prizes, cars or holidays. The makers of Never Mind the Buzzcocks, Qi and Celebrity Juice are seeking groups of 12 friends and families to take part in a new pilot. You need to prove how well you know them. Winners will win a luxury break. Applicants must be a resident in the UK or Channel Islands and no employed by FremantleMedia Ltd or Channel 4. To get involved in this exciting opportunity, email takeoff.uk@talkback.co.uk to request an application form. My Man Can is new from ITV with hosts Melanie Sykes and Mark Wright. This has a top prize of £50,000 and is ideal for couples who think they know each other inside out. If you are engaged, married or in a civil partnership or similar relationship then the My Man Can team are looking for you. If you think you know each other well and know how far you would both go to win £50,000 then why not apply. Local auditions are being held in July for contestants aged over 18 years and you will both need to be available for filming in London in September. The producers of My Man Can are seeking couples who can compete in challenges of strength, skill, stamina and precision and can enter this where you could win £50,000! Please email mymancan@itv.com and please send a picture of you and your partner.